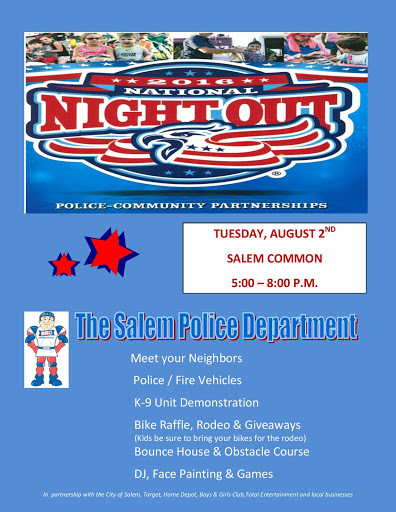 Don't miss Salem's first National Night Out! National Night Out is an opportunity for the community to come out and build relationships with your police department. We'll be holding our first National Night Out on Tuesday, August 2, 2016 from 5 pm to 8 pm on Salem Common. We will be showcasing a selection of police and fire vehicles, a demonstration by our Canine Unit, a bounce house, obstacle course, bike raffle, and more! Thank you to our sponsors Target, Home Depot, the Boys and Girls Club, Total Entertainment, and local businesses.